We challenge our student athletes to excel in the classroom and on the athletic fields. To meet these expectations, we need to provide our student athletes with state-of-the-art equipment and facilities. We cannot do that without your support. 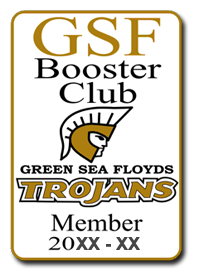 If you have an interest in helping the student athletes at Green Sea Floyds High School and if you wish to have a positive impact on the school’s athletic programs, you can begin by joining the Athletic Booster Club. Together, we can work hard to enhance the academic and athletic environment. There are currently two personal membership levels. $40 Membership Per Person: A free Trojan Souvenir, $10 Trojan Bucks, A right to vote at Booster Club Meetings. $100 Membership Per Person: Free Admittance to ALL HOME sporting events(excluding playoffs), Free Trojan Souvenir, $10 Trojan Bucks, a right to vote at Booster Club Meetings. 2016 – 2017 Parking Passes for Luther Enzor Memorial Stadium will be sold on a first come, first serve basis beginning August 10, 2016 at Meet the Trojans. Front Row parking (Spaces 1 – 20) are $25 each. Rows 2 -4 (Spaces 21 – 85) are $10 each. You must be a member of the Green Sea Floyds High School Athletic Booster Club to purchase a parking pass. You can also visit the Trojan Zone at any home football game to register.